Ask fellow campers about "Pyramid Lake Marina and RV Park" and nearby attractions. Ended up turning around and going back home. Very disappointed. We have been visiting Pyramid Lake RV Marina for many, many years. The price was $25.00 a night, a fair price for the only camp spot on the lake where you can escape boom-box hell. We arrived yesterday and discovered they doubled the price to $50.00 a night with zero improvements to the property. If you arrive when the ranger station is closed you will not be able to use the showers and restrooms, as access to use those requires a code. So as extras for your additional 25 bucks they offer no weed abatement, no WiFi, no pool, and a large portion of the road has been washed out and is coned off offering a fall hazard to children and pets. Wow. I'd pay $25 for the quiet. For $50, it's quiet at my home. We camped at Pyramid Lake Marina and RV Park in a Travel Trailer. For $50.00 a night most people want more than a parking lot with full hook-ups. It was great at the old $25.00 per night rate. Needs paint, better signage etc. It's pretty quiet here, no amenities for kids unless they fish for big Lahotan Cut-throat trout. Parked next to the "Mayor of the Marina", he's an good guy who looks out for everyone. We've been staying here the past 4+ years. Trout season is October to May. Then it's open to ski boats. There is also dry camping on the beaches and Pelican Point and it costs about $18.00 per night. We camped at Pyramid Lake Marina and RV Park in a Travel Trailer. Fishing during fishing season and water activities in the summer. Crosby's has a store and grill. There is a mini Mart next to the Sheriff's office where you pay for your space and buy your fishing permit. Upon arriving, the signs leading to the ranger station and the RV park itself were VERY faded and broken, mostly made of wood and you really have to keep your eyes open. And try not to drive down the wrong road. We finally arrived at the ranger station and checked in. Now, the price for the RV park is $25.00 per day, full hook-ups. OR $15.00 no hook-ups and you're on the beach. Or $400.00 a month which is an awesome deal. We stayed a week. We parked very far from the restrooms because I wanted to view the lake every morning, but the restrooms were clean and the water was hot. We didn't encounter any problems while at Pyramid Lake. There are lifetime RVers that live at the park and one gentleman in particularly wanted us to stay! Oh goodness we wanted to! But, sadly our full-time city employment calls and we have to answer. We camped at Pyramid Lake Marina and RV Park in a Travel Trailer. If you want to go fishing, you MUST obtain a permit which is $10-$15 dollars per day. And the tribe is very strict on how many fish you can catch. They have a special booklet at the ranger station of the do's and don'ts. Also, if you want to shoot fireworks, you need a permit for that as well. AND there's designated areas where you can shoot them. This is located in the desert and Pyramid is a desert lake. But, to us, Pyramid Lake is beautiful, with rugged mountains and desert scenery. The park, at least the front row, has a great view of the lake. For the money you get a large asphalt paved space, water, sewer, 30 amp electric and clean showers and bathrooms. Can't beat the value. But a shower without hot water is an ordeal. Apparently, when the propane tank for the hot water was refilled, the pilot light wasn't relit. And we could not find the friendly clerk or anyone else to get the hot water going. I really wanted to give this park a higher rating, but no hot water for the showers is a big no-no with me. We camped at Pyramid Lake Marina and RV Park in a Travel Trailer. If you like to fish, this is one of the best places for cutthroat trout. However, it is located on an Indian reservation so you need a special permit from the tribe. The things going for this place are that it sits right on Pyramid Lake, the woman who runs the check-in is very nice, and the scenery is great if you like that high desert look - the landscape all around is basically scrub. That said, it's basically a parking lot with electrical installations. The view of the lake is lovely, but the beaches are not well kept by the Paiute tribe that manage it - lots of litter and stuff lying around, and the beach shade huts need work. You can swim in the lake (we did), and since there's not anyplace else around to stay unless you want to go into the hellhole that is Reno, this may be your best bet. 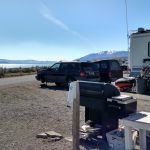 We camped at Pyramid Lake Marina and RV Park in a Motorhome. We had always wanted to see Pyramid Lake, NV but all we could find on the Internet was that there was dry camping all along the lake, all you needed was a permit from the Ranger Station. Much to our amazement, when we went to ask about a permit, they told us that Pyramid Lake Marina had full service camping. The campground is really nice... electricity, water, sewer and a very new, very clean bathroom with hot showers. The weekend we were there they were having a fishing derby but there were still some spaces available, lucky for us. Other times of year you might want to call to check on availability. Things to do in the area are mostly boating, fishing for cutthroat trout, bird watching (check out the famous White Pelican) and swimming in the warmer months. The Marina has a small store, but I would suggest stocking up and gassing up in Sparks as you are a captive audience and the prices reflect that. BTW, this is the Paiute Nation and if you plan to dry camp on the beach, fish, hunt or anything, make sure you first get a permit,(Signs all over) as the fines are large. Also make sure you walk the road before hand as there are soft spots in the sand and it appeared folks have gotten stuck in the past. We camped at Pyramid Lake Marina and RV Park in a Motorhome. 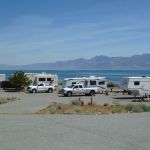 Are you affiliated with Pyramid Lake Marina and RV Park ?